Our line of separated combustion unit heaters features a compact, aesthetically pleasing construction. And our gas-fired unit heaters offer an option where infrared heating is not practical due to ceiling heights, clearances to combustibles or building use. The FA Series line of gas-fired, tubular exchanger, induced draft, hot air heaters are now available for use in commercial, industrial and agricultural applications. 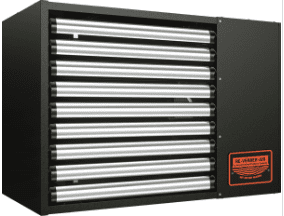 This line of heaters features a traditional design with a durable, powder-coated black enamel exterior and stainless steel louvers for an exceptional aesthetic appeal, and a swept-wing impeller with finger-proof fan guards for low noise operation. Gas Fired Unit Heater have additional features include operational troubleshooting lights and various mounting options. The FA Series offers an out-of-the-box separated or power-vented combustion option. The UH Series line of gas-fired, tubular exchanger, induced draft, hot air heaters are now available for use in commercial, industrial, agricultural and residential applications. 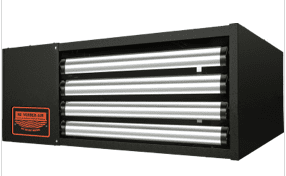 This line of heaters features a low profile design with a durable, powder-coated black enamel exterior and stainless steel louvers for an exceptional aesthetic appeal, and a swept-wing impeller with finger-proof fan guards for low noise operation. 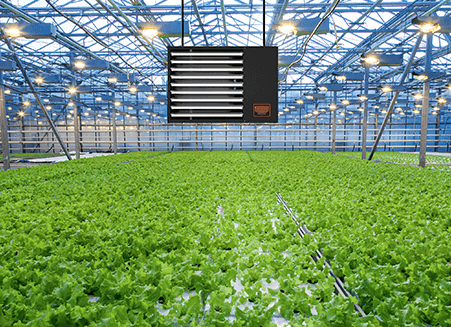 Additional features include operational troubleshooting lights and and integrated mounting brackets for ease in installation. The UH Series offers an out-of-the-box separated or power-vented combustion option.